I was asking my sister if she still had her old school cookery book. In the school she attended, they wrote all their notes for Domestic Science in a large copybook. It was the later section of the book that interested me. 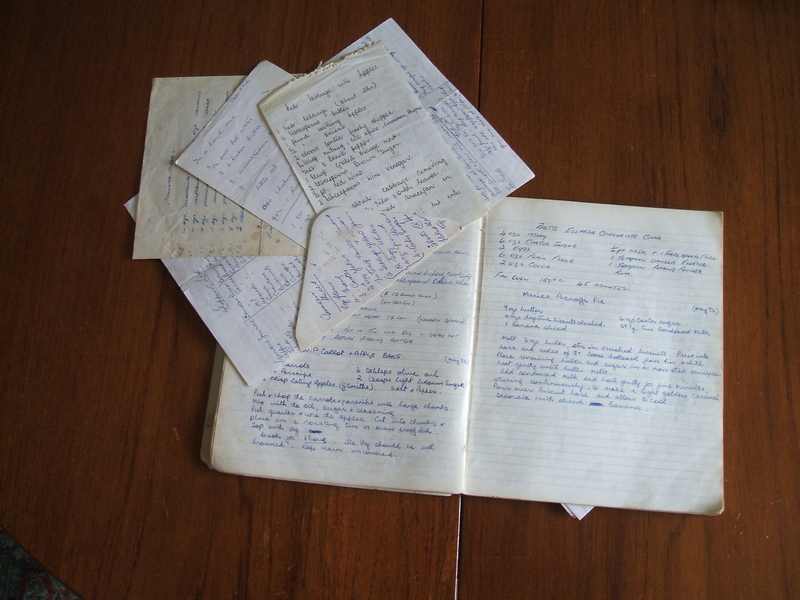 You see the copybook was less than half filled by the time she left school and she added recipes as she found or tried them. Mammy would write in the book too. Back in the days when Elly was small and we were going to see and stay with my parents for a weekend, I would spend a day baking and fill my tins with goodies to bring with me. Regularly I was asked to write out a recipe before I went home. So my hand wtiting was scattered among the pages too. With time and plenty of use the book is like us… getting old and fragile! Pieces of paper may fall out if you are not careful. The open book with some of the loose pieces of paper. 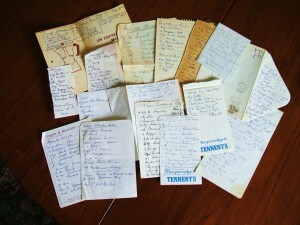 The loose pieces of paper are recipes written by different hands. They are living history, recalling for me members of my family, relations and friends – Not alone in the hand writing but also with a particular recipe that we associate them with! 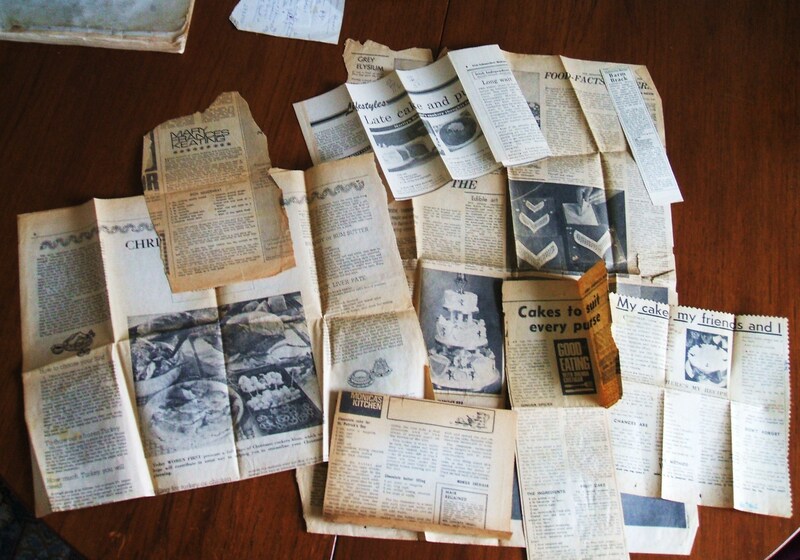 They were anything from a full page broadsheet to a tiny scrap. The names include Theodora Fitzgibbon, Monica Sheridan (do you remember her from early RTE- all her cakes flopped- something to do with studio heat and lights I am sure! ), Brenda Costigan, Monica Nevin and Mary Frances Keating. 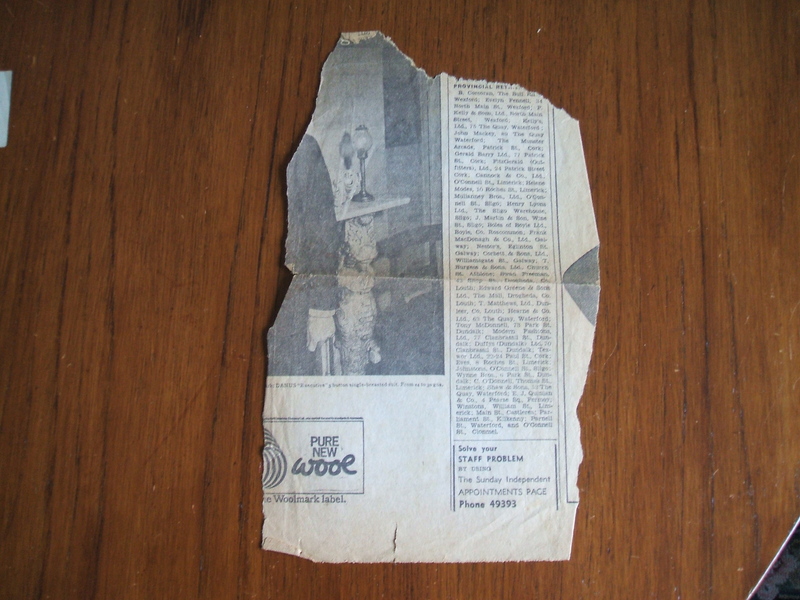 The oldest printed date that I can see is the wedding Cake, dated Thursday September 25 1969. I was all of 22 years old…. do you think she was planning my wedding in her head? 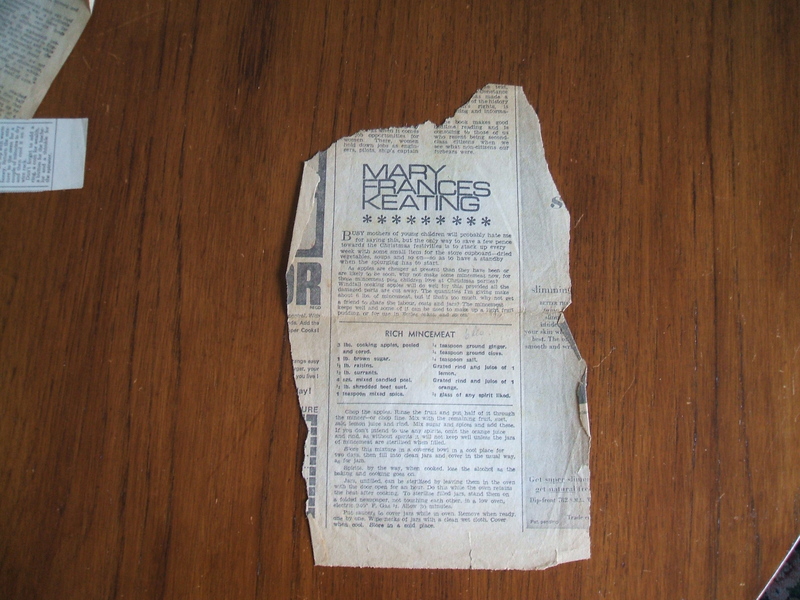 No complete article, but the torn advertisement is the clue. In tiny print it tells me it is a Danus “Executive” 3 button single-breasted suit, from 24 to 30 gns! When did they stop using Guineas? This entry was posted in memories, recipes on July 13, 2010 by Grannymar.